Today, canals are valuable to the heritage and leisure time of Britain, but only recently they were seen as hazardous ditches with little future beyond being filled in. So what changed? Wildlife watchers, joggers, walkers, bikers, boaters, our canal network regularly plays host to millions of people with all manner of interests and inclinations, but all drawn to the canal banks for their beauty, heritage and peace away from our other less tranquil thoroughfares. Their role may have evolved from their original function in the industrial age but arteries of British civilisation they remain. As magnets for modern activity, it’s hard therefore to fathom that as recently as the 1960s, they had the opposite effect. Canals were best avoided, widely perceived as both obsolete and, in being neglected and overgrown, even a liability. It was the arrival of the railways in the mid 19th century that triggered the slow demise of canal transport, as its role as the primary passage for commercial transportation was superseded by the locomotive. By 1940s canal use had largely dried up. The few boats that ferried on struggled through a dirty, overgrown and decaying system. Largely perceived as outdated and hazardous ditches, the canals faced a bleak future of abandonment and closure, and even the prospect of sections being filled in. From out of this low point in the history of the canal sprang hope in the form of a group of waterway enthusiasts who recognised the future potential of the canal system for both leisure and tourism. Formed in 1946, the Inland Waterways Association (IWA) began a long struggle of campaigning to win government, local authorities and the general public, over to their enlightened way of thinking. An influential force in this ongoing campaign was the book ‘Narrow Boat’ by the organisation’s first honorary secretary, L.T.C. Rolt. In recounting his 1939 honeymoon journey around the canals of the Midlands in a 70ft narrowboat, the book helped to spark a public interest in the history and spirit of life on the canals, and their future leisure potential. It was the tapping of that potential that ultimately helped The IWA achieve success with their campaign, over twenty years after it began. Inspired in part by the perennial popularity of holiday boating on the Norfolk Broads, the IWA encouraged canal boat-hire companies to begin hiring out converted working boats to holidaymakers and approached the British Tourist and Holiday Board to advocate these new schemes. The British public proved eager to embrace the idea of cheap, relaxing holidays afloat. The growth in interest in canal boat holidays throughout the 1950s and 60s would offer a powerful riposte to the fierce escalating pressure from local authorities and media to close down, or even fill in, these ‘unsightly’ and ‘dangerous’ canals. By 1955 the Board of Survey were recommending the disposal of 771 miles of waterways, and a further 994 miles would experience the same fate if traffic on them failed to increase. To counter such proposals and demonstrate to the authorities how the canals could be transformed into attractive features that drew visitors to their banks and to bank-side businesses, enthusiast volunteers even began repairing, restoring and smartening up the maligned waterways themselves. Recognition and reward for such determined efforts finally arrived on 25 October 1968, when the 1968 Transport Act was passed. This legislation finally acknowledged the value of the waterway network for leisure use and would effectively stop the rot and secure the canal network for future generations. 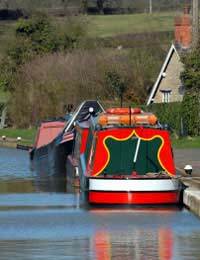 Revival and GrowthBritain’s canal system is now not just thriving, with three times more boats using it than in 1968, it is even growing again, and not only from the numerous abandoned sections being reopened. July 2002, for instance, saw the opening of Britain’s first new canal for over a century, the 3.3-mile Millenium Ribble Link at Preston. It was originally intended to have been built to connect 58-mile Lancaster Canal with the rest of Britain but was abandoned due to lack of funds. More recently the Leeds and Liverpool Canal was linked to the South Docks in Liverpool as part of a £22m project that added 1.4 miles of navigable waterway to the canal network. Work is also underway to create the Fens Waterways Link that will connect up navigable rivers and existing canals and create a circular route between the east England towns of Lincoln, Peterborough, Ely and Boston.